This cosy Shoreditch cafe serves the premier vegan fish and chips we've had the honour of trying in London. Their secret: not focusing on the flavour of the tofish too much (although it's still tasty), instead going for texture, which the tofu and batter get spot on. The flavour comes from everything else; the incredible tartar sauce, the just-mushy-enough mushy peas, and chips with a proper homemade vibe. From there, just a bit of ketchup and vinegar is needed to round out the experience. The aforementioned homemade vibe extends to the cafe itself which doubles up as a community centre — warmth emanates from the place. Sutton & Sons is a proper fish and chipper, with over 20 years of experience serving actual fish and chips around Hackney. Then it introduced a vegan menu in its Stoke Newington branch in early 2018, before giving that menu its own restaurant in Hackney Central. We tried the vegan menu at the Stoke Newington branch, which made the bold decision of straying from the tofu-based fish replacement formula, and instead opting for banana blossom as a base. This pays off when it comes to the scampi, the most accurate vegan specific fish replacement we've ever eaten. It's not quite as successful at the standard fish and chips — too chewy, although the chips themselves are proper old school beasts, adept at soaking up the salt and vinegar. The Coach and Horses proudly proclaims itself as London's first vegetarian and vegan pub, so obviously it has to have a fish and chips replacement on the menu. Enter Tofush and Chips, tofu wrapped in seaweed and cooked in tasty vegan beer batter. All totally delicious but a couple pieces of advice; firstly, this is a boozer in Soho, so if you wander in on a random evening, your chances of nabbing somewhere to sit aren't always too strong. Secondly, Wednesday and Saturday night the pub holds singalongs. It's a brilliant night out, just don't expect a quiet place to nosh. Fish and chips isn't the first thing people think of when they hear Loving Hut — the excellent Asian vegan food with clever meat substitutes usually springs to mind. However, the vegan mainstay at the top of Holloway Road puts its own spin on fish and chips too. Sure, it's more fries than chips, and there are no mushy peas (sacrilege? ), but get past that and there's a tasty meal here. And having coleslaw and salad included mixes things up a little. Whereas everywhere else on this list is a dedicated vegetarian or vegan eatery, the Dovetail in Clerkenwell isn't. However it still caters to that demographic, with a small but worthwhile vegan menu. On said menu? Beer battered 'fish' & chips — and once again, that fish is good old reliable tofish. Unlike most tofish dishes where one can only see the batter from the outside, this is a different proposition with the green nori seaweed seeping through, leaving you in no doubt as to what's going on inside. Tempted? The Dovetail does meat-free Mondays, where you can have any two of the meat-free mains for £15.95. By Chloe combines tasty vegan food with Instagram aesthetics. It's a huge hit with celebs and 'influencers' stateside, so it's not surprising that the place is equally popular in London. A traditional fish 'n' chips is on the menu, and while it's not the dish you have to try there — that's the unreal Pesto Meatball sub — it still acquits itself finely. 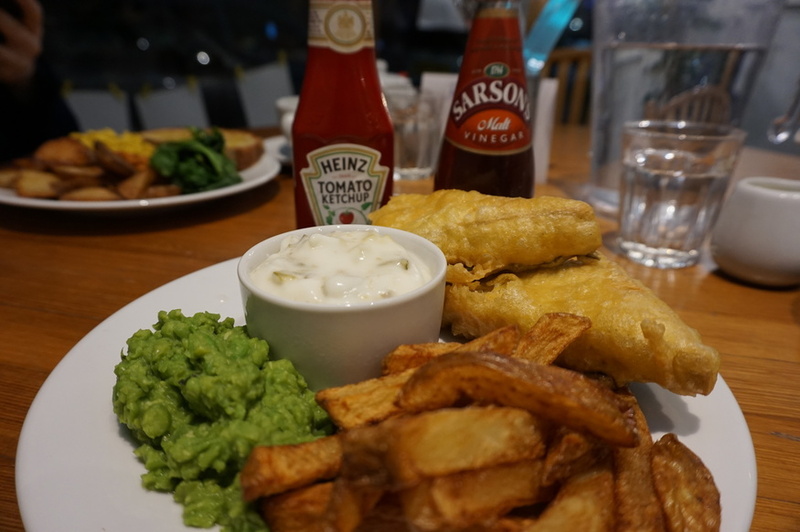 Good tofish, fantastic thick chips, vegan tartar sauce and not-that-mushy mushy peas (perhaps there's no way to make real mushy peas look nice on the 'gram). A solid option. By Chloe, Covent Garden & Tower Bridge branches. 🔥🔥Aubergine never tasted so good!🔥🔥🔥 Fillet-Om-Phish burger @mooshieslondon 104 Brick Lane. Have you tasted it? This one's a bit of a cheeky entry, as technically Mooshies doesn't serve regular fish and chips. Instead it's all about (vegan) burgers here, one of which is a fish imitator. The Phillet-Om-Phish contains panko fried aubergine, tartar sauce, nori seaweed and lettuce. The aubergine isn't the best fish substitute — and the whole thing is rather messy, with oil dripping everywhere — but the burger as a whole comes together. Enjoyed along side some fries — standard, sweet potato, or (vegan) cheesy — and this is a thoroughly 21st century portion of fish and chips. Got any other favourites? Shout them out in the comments below.